my daughter Abbie's fifth birthday party, and had a request for the recipe. airtight container, they keep well for 5 days or more. Preheat oven to 275 degrees. In a mixing bowl with whisk attachment, whisk egg whites to soft peaks. Begin adding sugar a spoonful at a time, whisking 20-30 seconds after each addition. Continue whisking until mixture is stiff & shiny and all sugar is dissolved. Add rose water (or any flavor extract you care to use) and food color and whisk until incorporated. Using a piping bag fitted with a 1M open star tip, pipe meringues onto a parchment lined baking sheet. Here is a tutorial on how to pipe a rose swirl. Top with sprinkles if desired. Bake for 2 hours or until completely dry and crisp. I'll share the recipe for the french cream. Yet another beautiful creation. You are amazing. And oh, so pink. Love it! Holy smokes! I just made the exact thing yesterday (minus the rosewater). Great minds think alike! Thank you so much for sharing the recipe!! I will definitely try this soon. I hope mine will turn out as beautiful as yours. Hi. 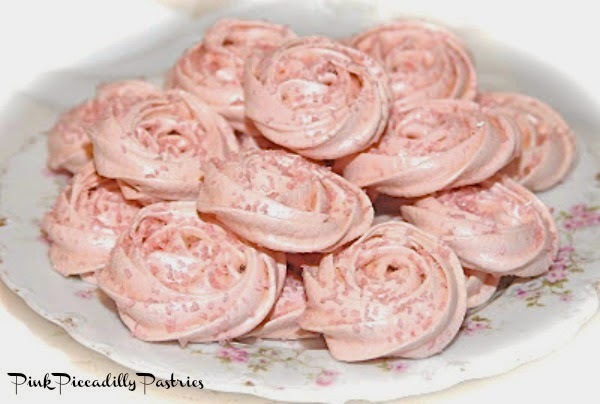 These look lovely and I love using rose water! Can I use granulated sugar in place of castor? Hi Melanie! Caster sugar is a fine form of granulated sugar that I like to use in meringues because it dissolves more easily. (I use Dixie Crystals extra fine granulated sugar.) But, if you don't have that at home you can either whiz regular granulated sugar in a food processor, or just use regular granulated sugar and just make sure that the sugar is dissolved before baking.